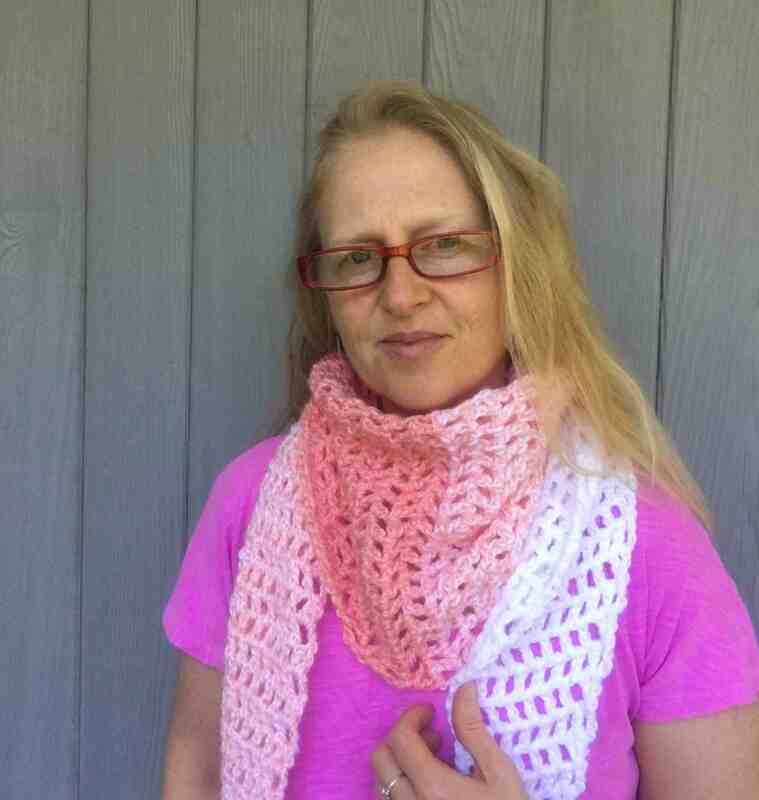 Here is a free Tunisian Crochet Pattern. To purchase the ad-free version with charts and more images, you can click here to buy it on Ravelry. 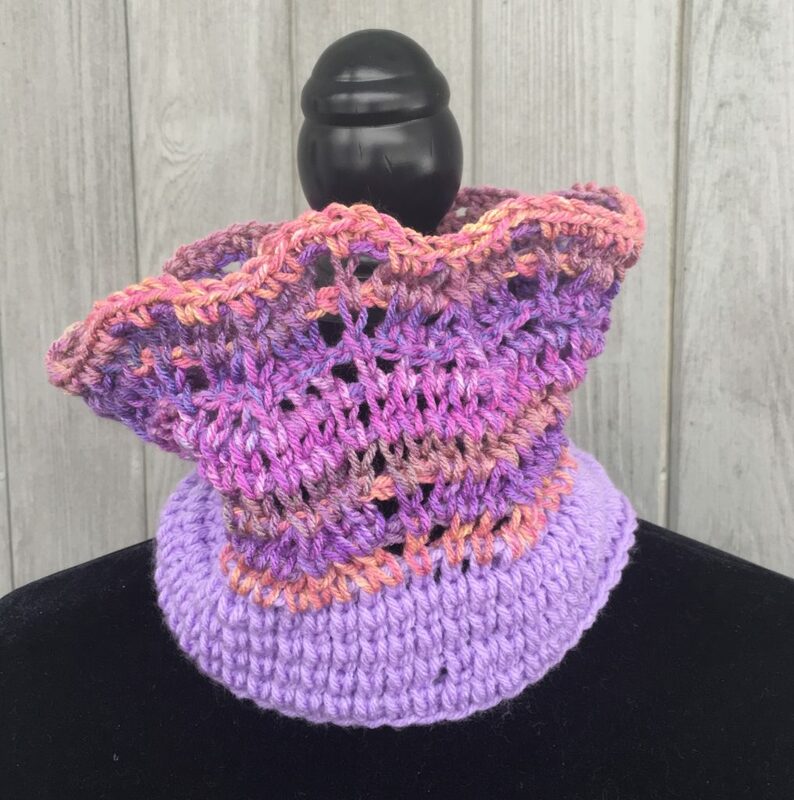 This is an Intermediate Tunisian Crochet Cowl using primarily the TEKS: Tunisian Extended Knit Stitch which of course makes it look like a knit garment. A nice feature of using TEKS is there is no curling of the fabric which often can happen with Tunisian Knit Stich. Another nice feature of using this stitch is that this project works up fast in about 1-2 hours. The garment is worked flat and sewn into a cylinder when finished. This pattern incorporates a CDD (central double decrease stitch) to create a beautiful lace pattern. It can be worn with the lace side up or down. I love the CDD combo in knitting: central double decrease, also known as S2KP2. I love how it creates this slightly elevated single straight row of knit stitches. I worked hard to get this knit lace pattern to look right in Tunisian crochet. After a couple days of trying different combinations, I finally got it. Now you can have it too! Pretty exciting! What’s also really cool about this lace stitch pattern is you can take it and use it to edge a shawl, sweater, blanket. You can extend it and embellish it. Hope you have as much fun with it as I did. Purchase the ad-free version with charts and more images, here on Ravelry. Check out these two tutorial pages on Bluprint. These are free, but they also have some really good Tunisian Crochet classes too. Or approx. 200 yards of (4) worsted weight yarn of your choice. Click to choose at LionBrand. J, 6.5 mm Tunisian crochet hook. I like the Denise interchangeable sets. It’s a good investment. Intermediate: This project uses yarn with basic stitches, repetitive stitch patterns, and basic lace patterns finishing. M1 = make one in top two bars. Start and finish with a long yarn tails, about 12”each to be used for sewing the garment together at the end. Keep count of your loops on each pass to ensure no lost or added stitches, bearing in mind that during the lace portion stitch counts change on some rows. On the second row of lace keep in mind that when you get to the CDD st of the previous row, be sure to put your hook through all 3 of the combined loops of that st. If you miss an increase you can add it in the following row. If you forget to switch stitches at a CDD point, you can switch them when you come to them on the reverse pass. Just carefully remove stitches and swap their location. Begin: Ch 58 or use a multiple of 8 stitches plus 2, if you want to make it wider or narrower. NRP – Normal Return Pass: pull thru 1 lp, pull thru 2 lps until 1 lp remains on hook. Row 1 Color A Ch1, TEKS across until last st. TESS in last st.
NRP – Normal Return Pass. Row 2 – Row 4 Color A Repeat Row 1. Join Color B at the end of Row 4 Return Pass when 2 loops left on hook. TEKS in next 4 sts)* Repeat * to * across to last st.
Ch1, pull thru 2 lps)* Repeat until 2 loops remain. Pull thru last 2 lps. M1 (TEKS) in 2nd ch (top 2 bars) before next st.
M1 (TEKS) in 1st ch (top 2 bars) after last st.)* Repeat * to * across to last st.
Row 8 (Color B) Repeat Row 1, NRP. Row 9 (Color B) Repeat Row 5, LRP. Row 11 (Color B) Repeat Row 6. Sc in back bump of next 2 ch sts), * Repeat * to * until last st.
With wrong side facing out, join the 2 ends together to form a cylinder. With yarn needle sew the 2 sides together. See pictures below. 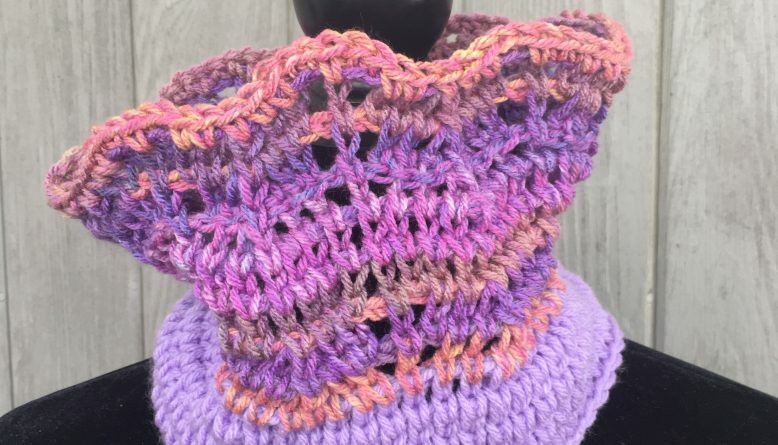 Turn right side out and enjoy your Dusky Sunset Tunisian Crochet Cowl! Thank you for visiting. Click below to purchase this pattern as a convenient PDF file which you can save and print easily. The paid pattern includes a handy pattern chart.